Sound Concepts is one of the leading audio-video equipment providers in the Philippines. Having a wealth of experience in the audio-video field, it has steadily gained a solid reputation among customers in the industry. Sound Concepts understand that each person's taste in sound is as diverse as his or her taste in music or art. Thus, it is ready to help customers find their ideal equipment, allowing them to really enjoy their music. ​Among the well renowned brands that Sound Concepts carries are : Paradigm Speakers, PSB Speakers, Marantz Electronics, NAD Electronics, Velodyne Subwoofers, Mission Speakers, Thorens Turntables, Blue Sound, Anthem Electronics, Martin Logan Speakers, QED Cables, Elac Speakers, and I-FI Audio. ​ These great brands can be auditioned at our Affiliate Dealers and various Showrooms. Sound Concepts has gained expertise in different audio-video applications for home and commercial purposes. It mainly offers the following services: (a) Home Theater Installation; (b) Home Theater Design and Construction; (c) High-End Two Channel Audio Installation and Consultation; (d) Room Acoustics; (d) Audio and Video Calibration; (e) Audio-Video Systems Integration and (f) Multi-Room Audio Audio Installation. ﻿﻿Sound Concepts has sponsored, joined and attended major Audio-Video events in the Philippines and abroad enhancing its expertise and exposure in sales and demonstrations. 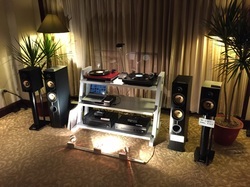 Sound Concepts exhibits at the annual November Hi-Fi Show and its personnel have attended well known audio-video shows across the globe. You can audition Sound Concepts' great products at its various Affiliate Dealers. Sound Concept is also the proud sponsor of the Manila Audio Club where Invitees can audition various equipment in several Session Rooms available.